Two hundred golden, gleaming hulls, gathered on the fringes of the Vak’Atioth system. Amarrian arrogance had mandated the use of such a small force. They did not expect resistance. For the Amarrians, this was to be a great day. It would renew faith in the Reclaiming, a faith much needed. For weeks they had been advertising their intentions to crush the Jovians; flooding communications networks with propaganda proclaiming their people the chosen of God, rightful owners of the Jovian people. Vak’Atioth was not a primary system within the Jovian Empire. It lay upon the edge and contained only various small research facilities. It was, nonetheless, here that the mighty Amarr Empire had chosen to show the Jovians the undeniable might of their squadron, a force not even approaching the full size of the great Amarr Navy. The Jovians valued one thing above all else – information. Their need for information had led to the formation of the Jovian intelligence network, an entity with eyes and ears in most Empires’ internal archives. It delivered to the Jovians every plan the Amarrians had laid out for their assault – even before the Amarrian commanders themselves had received the information. This allowed the Jovians to plan extensively for the battle that would take place in one of their own systems – then called Vak’Atioth, now known only as Atioth. It was a rich and diverse mixture of battleships and cruisers, each ship equipped with state of the art Amarrian laser technology. Their ships were bulky and slow, but made up for their lack of agility with the devastating power of their laser batteries. The fleet organized itself in typical Amarrian military fashion - a staggered line designed to maximize the ghastly effect of tachyon fire against the enemy’s front. Their hulls adorned with religious texts, broadcasting messages of Amarrian supremacy, interspersed with litanies and psalms in honour of the Reclaiming. This was their moment; this was what they lived for. The first volley of fire erupted from an Apocalypse, its turrets taking aim and firing as one, blood-red beams slicing into the side of a stationary ship until the vessel’s hull ruptured, pieces of it scattering like dust among the rank and file of the Jovian force. The Jovian forces split into smaller wings, each numbering 5 ships, all equipped with devastating Jovian laser technology. Accelerating with frightening speed, they dove into the Amarrian attack forces. Amarrian cruisers equipped with close-range weaponry moved to intercept as wave after wave of the smaller vessels engaged single targets, like a furious pack of wolves, dodging and weaving, maximizing maneuverability. And then it happened. Massive, eerily green blasts erupted from seemingly nowhere, and an Amarrian Apocalypse went up in flames. Another blast erupted what seemed mere seconds later, and tore through a squad of Mallers, their hulls briefly flickering with bright green energy discharges. The Amarrians did not expect this. Their rigid command structure inhibiting communications, they did not realize what was happening. Lack of coherence and interoperability in the fleet meant that they could not cope with the sudden appearance of this unseen terror. It was a Jovian Mother ship. Swooping in, the Jove frigate forces caused even more confusion, sending the Amarrian forces into disarray. At this point, communications broke down. Amarrian battle doctrine demanded sacrifice, and so the Navy could not disengage. Captains and their crews valiantly threw down their lives for the Empire, confident that they, God’s chosen, would be victorious. The few that retreated would later be executed for cowardice, their families enslaved and their Houses disbanded. 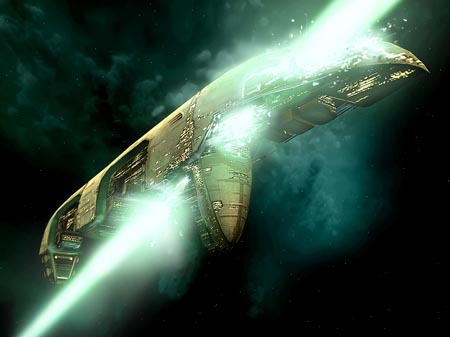 For hours streams of glaring light lit up the system that night, the nimble Jove frigates diving into the Amarr fleet, their ranged cruisers supporting them with laser-fire over a distance and the titanic Mothership firing blast after blast of its extreme-range weapons; cannons created specifically for this battle. The smaller vessels holding the Jovian line prevented Amarrian squads from coming close enough to fire upon their nemesis, leaving the fleet defenseless against its onslaught. Battleship after battleship exploded in a violent bursts of light under the attack from the Jovian mother ship. This left the Amarrians in a position they had not been in before – What could they do but press on and die? Not six hours later Vak’Atioth was overflowing with the remnants of hulls drifting into the emptiness of space. The Jovians had won the first battle of this war; the majority of the Amarrian fleet had been demolished whilst only a third of the Jovians ships had been lost. The Amarr knew they had to respond quickly and in numbers. Publicly, they blamed impetuous leadership for the headlong assault on the Jovians – even if that was exactly what Amarrian battle doctrine had dictated. So it was that captains that had given their lives for their Empire without a single thought of retreat were posthumously discharged from the Navy, their reputations ruined and their families disgraced. A much larger fleet was ordered to gather in preparation for another assault upon the Jovians. They never got the opportunity to react. The Matari chose this moment to rebel against their Amarrian masters. Uncannily well equipped for slaves and high on morale, they proved more than a match for their demoralized Amarrian captors. Faced with losing their grip on the Minmatar, the Amarrians had no choice but to redirect their entire military force to the home front to handle the rebelling slaves. To this day, rumours circulate that the Gallentean Federation secretly outfitted the rebels with weapons, ships and supplies. And thus, a quick and hasty peace was agreed upon with the Jovians; if only to allow the Amarrians to concentrate on themselves. The Amarrians agreed not to attack the Jovians again. Both sides knew this was not sincere. However, the Jovians were happy to settle and continue as they were. To them, the complexities of the barbaric Amarrian nature were of interest only in the academic sense. Their handling of the Amarrian fleet blessed them with the reputation of an entity not to be tangled with. No-one has attacked the Jovians since.